Imagine a textbook that you can download, is open-source, is up to date with the latest information and you can comment on? Well, it exists. It’s called a “Flexbook” and today the state of Virginia released a Physics Flexbook online for a 2 week public review. The 11 chapter online textbook contains a chapter devoted to teaching physics with modeling and simulation. It uses three Learning Labs developed with STELLA and allows students to interact with them using the free isee Player. We got involved with the Physics Flexbook project last fall when we met the director of the program, Jim Batterson, at the MODSIM Conference in Virginia. He told us about a “wiki-style” online physics textbook that allowed teachers and scientists to collaboratively develop the content. The content would be free for anyone to use, share and adapt and contain the latest scientific information. We thought this sounded like a fantastic idea and pledged our support for a chapter of the book that incorporates modeling and simulation to teach physics. Our friend Mark Clemente wrote the chapter and we setup a web page to host the STELLA models and allow easy access to the isee Player to interact with the models. Earlier this week, Joanne and I were back in Virginia for the VSTE 2009 Conference (Virginia Society for Technology in Education). We attended Jim Batterson’s session on the Physics Flexbook where we got the full story on the inception and development of Virginia’s first open-source, online textbook. The session was very inspiring. Jim Batterson is a retired NASA Engineer, former physics teacher and school board member. While Jim was at NASA he was chosen to direct a review of Virginia’s Standards of Learning (SOL) in science education. The goal was to come up with recommendations for the state on how to better meet the needs of the 21st century workforce. In the summer of 2007 under the Virginia Secretary of Education, a panel of practicing scientists & engineers met to conduct a “gap analysis” to help inform the state’s 2010 science Standards of Learning review. What did they find? The current standards were severely dated to the mid 20th century. 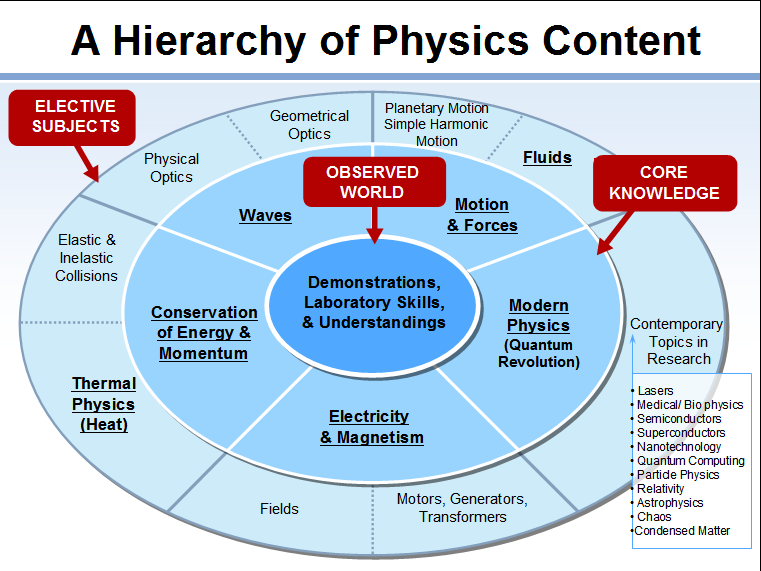 Physics standards should include a significant amount of contemporary and emerging (21st century) science. Laboratory content that uses industry state-of-the-practice technologies should be at the center of learning. Teachers should have open-source software such as a “wiki” available to create, share, and develop contemporary and emerging science content in a timely way. Jim said that at first, there was concern that if the content was online and collaborative, how could the state ensure the content was correct? Jim pointed out the current physics content is inadequate. With the state scheduled to define new science Standards of Learning in 2010 it would take 2 or 3 years to get the recommended changes into published textbooks. Then a few more years to get them into the classroom. An online wiki-type of “flexible textbook” will clearly allow the content to be current, relevant and easily corrected for errors. The panel decided to implement a multi-stage review process for the 11 chapters of the pilot Physics Flexbook. Each chapter underwent a technical review by professionals in the field. The chapters were also peer-reviewed like a technical journal. Today the Physics Flexbook goes online for a two week public review. 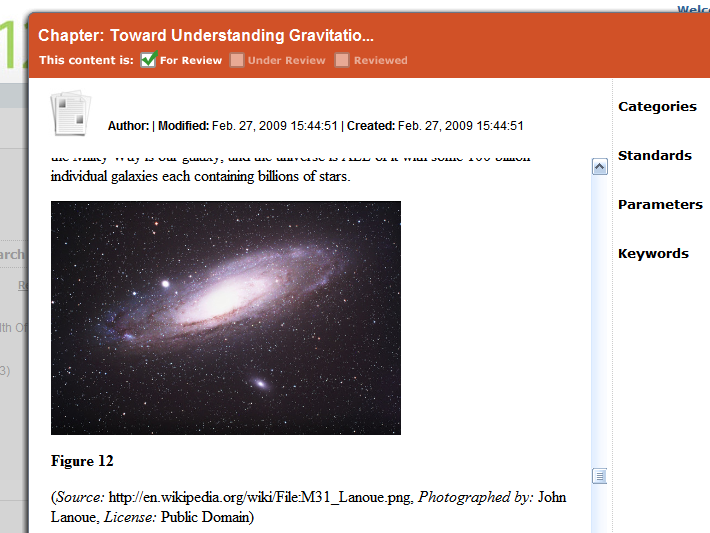 Down the road, the Flexbook system will add the ability for teachers and students to comment on the content. The idea is that the chapter itself would be locked, (different than Wikipedia entries), but the authors would be able to periodically update the chapters to correct errors and add new content based on feedback from teacher and student comments. Everything in the Physics Flexbook is licensed under a Creative Commons Share Alike license. We are very excited to see an entire chapter devoted to modeling and simulation. The chapter uses three Learning Labs developed with STELLA: Virtual Bungee Jumping, The Pendulum Story and President & Prime Minister (which illustrates Netwon’s Law of Cooling). And it’s fun! Students can dial in the number of strands in the cord (spring constant), their weight and height of the platform. The goal is to not splat into the pavement. 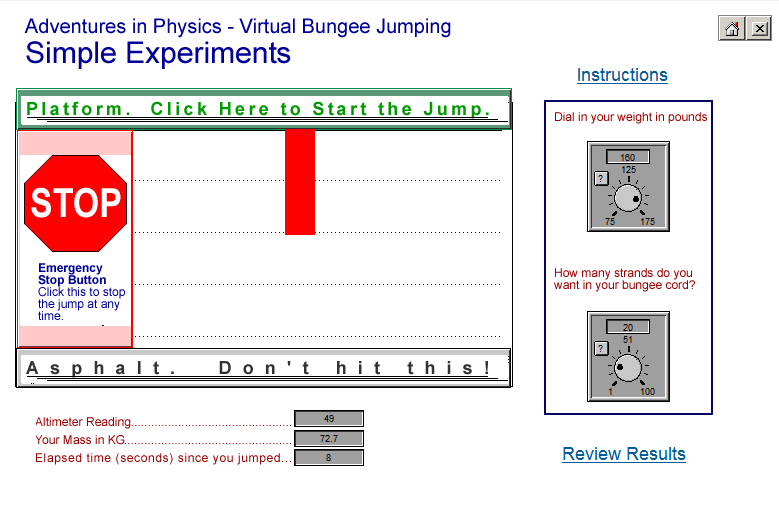 In more advanced experiments, the students can control gravity so they can see what it would be like to bungee jump on the moon. Marks says that students love to test the extremes. “What if I turn this dial all the way up?” Students soon see that patterns emerge no matter what they do. This type of simulation helps students understand the relationships in the system. Investing in education is something we’re very passionate about. We would like to thank Jim, the authors and the state of Virginia for taking this bold step forward! Good luck. You can download the slides from Jim Batterson’s presentation on the MODSIM Wiki. Visit the Physics Flexbook here and take a look at the STELLA models too.